The National Museum of Racing and Hall of Fame will be offering free admission each Friday from 2 p.m. to close through the end of the year compliments of Embrace The Race. “Free Fridays” begin June 30 and continue throughout the year, including the Saratoga Race Course meeting. Visitors are invited to take advantage of the opportunity to explore all of the Museum’s offerings, including its newest exhibit, “Man o’ War at 100,” which chronicles the racing career and cultural impact of the 1957 Hall of Fame inductee. 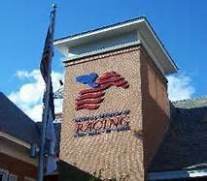 The National Museum of Racing and Hall of Fame is currently open from Tuesday through Sunday from 10 a.m. to 4 p.m. From July 21 through Sept. 4 (Saratoga Race Course dates), the Museum is open every day from 9 a.m. to 5 p.m.
About Embrace The Race: Founded and based in Saratoga Springs, N.Y., Embrace The Race is the exclusive provider of The Apparel for the Horse Racing Lifestyle and The Official Apparel of Horse Racing. Featuring an inspirational logo and impassioned phrase, Embrace The Race captivates worldwide customers with luxurious clothes, accessories, jewelry and more. Shop today at www.embracetherace.com, Embrace The Race Company Store in Saratoga Springs, N.Y., and at the National Museum of Racing and Hall of Fame. For more information about the Museum, including hours, special events and program offerings, please call (518) 584-0400 or visit our website at www.racingmuseum.org.